It's safe to say that when it comes to candles, I tend to go a little crazy. I love candles of all shapes, sizes and smells, from all variations of brands - lets just be honest here, it's an addiction. But having an addiction to something as luxurious as candles can rack up quite the credit card bill, and I'm sure many of you can agree that there needs to be some more companies that's a little bit more, shall we say, purse friendly. 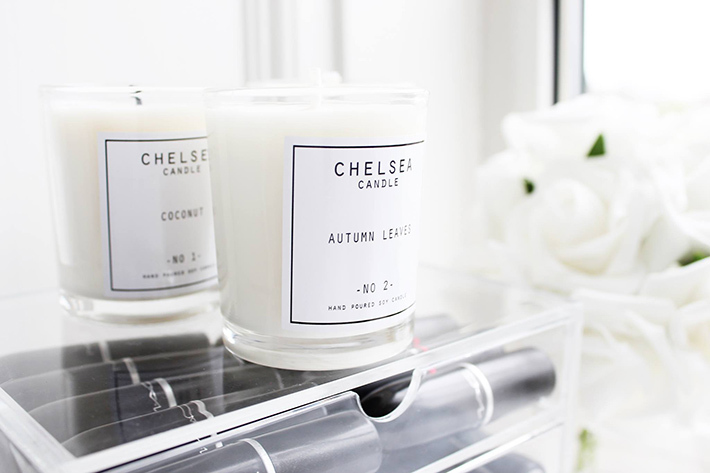 Recently, I was lucky enough to work with the lovely Chelsey from www.chelseacandle.com; Chelsea candle are a brand based in Kent, England who create high quality, affordable soy candles blended with equally high quality fragrance oils. I was lucky enough to receive 3 of Chelsey's candles in the scents Coconut, Autumn Leaves and Amber and Lavender. Each candle although small, carry a mighty scent and once lit, fill the whole room with the most glorious of smells. I'm honestly so overwhelmed and impressed by the quality of this brand, and I'll definitely be picking up some more to add to my collection. At the incredible price of only £5 per candle, you get a gorgeous 90ml, 15 hour burning candle; and at the end of it all, you also get a beautifully packaged jar to use for storage - I'll definitely be using mine for my ever growing brush collection. So, Will you be checking out Chelsea Candle? And what're your favourite candle brands?